What is the abbreviation for Bureau of Political-Military Affairs (DOS)? PM stands for "Bureau of Political-Military Affairs (DOS)". A: How to abbreviate "Bureau of Political-Military Affairs (DOS)"? "Bureau of Political-Military Affairs (DOS)" can be abbreviated as PM. The meaning of PM abbreviation is "Bureau of Political-Military Affairs (DOS)". One of the definitions of PM is "Bureau of Political-Military Affairs (DOS)". 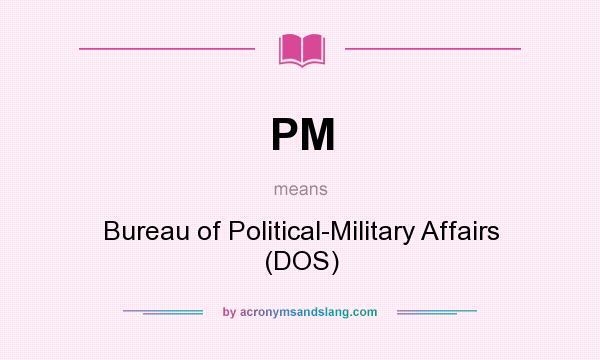 PM as abbreviation means "Bureau of Political-Military Affairs (DOS)". A: What is shorthand of Bureau of Political-Military Affairs (DOS)? The most common shorthand of "Bureau of Political-Military Affairs (DOS)" is PM.